The Kiawah Island Dolphin Education Program began in September 2017 and is a cooperative effort between the NOAA National Marine Fisheries Service (NMFS), the Lowcountry Marine Mammal Network (LMMN), and the Town of Kiawah Island. The program is currently funded by the Town of Kiawah Island through August 2019. LMMN also started a similar program on the Seabrook side of the inlet earlier this summer, with support from the Town of Seabrook Island. Trained volunteers and observers, called educators, are stationed at Captain Sam’s inlet to observe and record dolphin behavior, educate beachgoers, and reduce negative interactions between people and dolphins. During the first 9 months of the program, 10 trained volunteers from Kiawah participated along with staff from LMMN. These educators have logged more than 400 dolphin sightings and spoken with over 1,000 beachgoers during this time period. • Kayakers are responsible for the majority of negative interactions with dolphins, typically by approaching too closely and disrupting feeding behavior. • At least 11 different dolphins have been documented strand feeding in the inlet, all of which appear to be part of a pod (a dolphin family unit) that lives all year in the river. 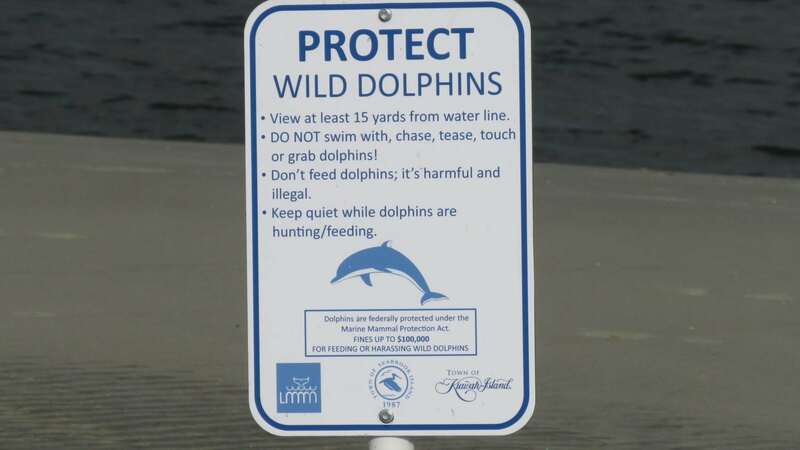 • One female dolphin has been documented in Charleston since 1995, is more than 27 years old, has had 5 calves, and has been seen strand feeding with her 16-year-old independent calf at the inlet. She’s been seen over 70 times. • Another female has also been documented in Charleston since 1995 and has been seen with several calves. She currently has a calf and we’ve seen the calf “practice” strand feeding at the inlet.